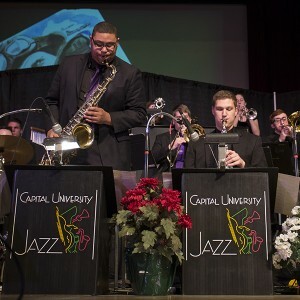 Capital University’s Conservatory of Music celebrates the 41st birthday of its Jazz Studies Program by presenting the 23rd Annual Jazz & World Music Festival from April 3rd to April 25th, 2017. The festival schedule features performances from a wide variety of student, faculty and and world-class jazz musicians along with clinics and workshops. All events are free and open to the public, and will mostly be held in the Conservatory of Music facilities. The festival kicks off with student recitals at Huntington Recital Hall, including full recitals by trumpeter Rachel Spencer and bassist Marty Quinn (winner of the Capital 2016 Mark Flugge Jazz Award) on Monday, April 3rd (8 – 10pm) along with pianist Jacob Campbell on Tuesday, April 4th (9 – 10pm). A big day for students and performers of all ages is the Jazz Ensemble Invitational on Friday, April 7th, which kicks off in the Conservatory at 10am with the Capital University Big Band, under the direction of festival coordinator Dr. Lou Fischer, joined by featured guest artists: Ndugu Chancler, world-renowned drummer/percussionist extraordinaire; Fred Hamilton, head of the guitar department at the University of North Texas; and Steve Allee, jazz piano instructor at Cincinnati Conservatory of Music. The rest of the day includes clinics and many fine performances by guest school ensembles and many Capital ensembles. Other highlights include: a performance by highTIME, Fischer and Chancler’s fusion ensemble, on Thursday, April 6th (8 – 10pm) (Huntington Recital Hall); a faculty recital by guitarist Stan Smith on Sunday, April 9th (7 – 9pm) (Huntington Recital Hall); a performance by SPECTRUM, the Capital Jazz Faculty ensemble, on Monday, April 10th (7 – 8pm) (Bexley Library Auditorium); and Guitar Studio Recitals by solo musicians and student groups on Thursday, April 20th (8 – 10pm) (Huntington Recital Hall). Visit the Jazz and World Music Festival page to learn more about the guest artists and see the full schedule, including outdoor community concerts by student ensembles at the Reflections Fountain, in the center of Capital’s campus.